Upstate Renegade Productions © were established in 2001 with the release of;- Wishing Well - Derry Musician's & Artist's CD for Foyle Hospice. In reality our name was conceived a good year before that. I was on the Eurocat Performing Arts course at The Playhouse Theatre here in Derry. There were many talented artists, performers and writers on this course. One of them was an actor, musician and writer called Stephen Connelly. We were drinking buddies and had both worked as arts drama activists and actors or in and around performance, film and theatre for most of our lives. Stephen was working on a short stageplay script and asked me if I would join in. I did. His play was called - The Site, and was set on an English building site staffed by Irishmen from various social backgrounds. I was also working on my own performance piece, a revisit to an old song of mine called, Cool. Aisling Doherty and Rachel Scilley worked with me as female vocalists. The song sort've resounded around the theatre. Stephen, who had worked on and off as an acoustic percussionist also got involved and the song took on a real earthy and organic feel. Time marched on. Stephen decided that his play needed some more work done to it and instead focused his energies on helping me out with the song. We rehearsed at every opportunity. 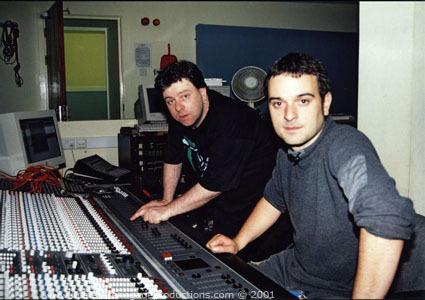 Stephen sadly passed away in October 2000. To mark his passing and to celebrate his life I decided to have Cool recorded with an aim to raising money for whatever charity his family wished. They asked that any money raised go towards the Foyle Hospice Daycare Unit Appeal. I went on local radio and television. I was interviewed by newspapers and I drummed up interest in putting it all together. Other artists and musicians heard what I was doing and offered their own material. The whole thing just rolled from there. The CD - A 12 track disc of original works by many of Derry / Londonderry's artists, musicians and poets was launched in Sandino's Bar on the 4th October 2001. It includes 2 versions of my song; Cool. One performed by Aisling Doherty with the Gay McIntyre Jazz Quartet*, and one performed by Terence Morrison with the Gay McIntyre Jazz Quartet**. Other recording artists on the CD include; Eamonn Toland, Jim Walker and Sam Starrett. The entire project was a cross community success story and can be bought directly from Foyle Hospice for £11.99 + Postage & Packaging. ^ COOL - A song by Louis P. Burns aka Lugh ©. All Rights Reserved. This version performed by Aisling Doherty with the Gay McIntyre Jazz Quartet. Features on Wishing Well - Derry Musician's & Artist's CD for Foyle Hospice 2001. 1st version. ^ COOL - A song by Louis P. Burns aka Lugh ©. All Rights Reserved. This version performed by Terence Morrison with the Gay McIntyre Jazz Quartet. 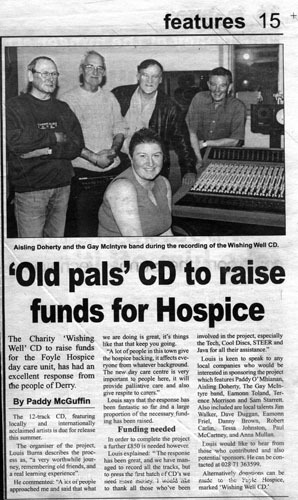 Features on Wishing Well - Derry Musician's & Artist's CD for Foyle Hospice 2001. 2nd version. Upstate Renegade Productions © currently work with artists, performers and writers in a realtime and online environment to put together collaborative new media arts, e-literature/poetry, film and music video productions. Best wishes and thank you for visiting. Click here to contact Louis P. Burns - Owner of Upstate Renegade Productions.